SUNWISE SOLUTIONS is a performance driven - results oriented - quality assured Information Technology consulting and services company. Our practice areas are Enterprise Data Management, Clinical Data Management and Green Data Management. Doing things 'right' is the motto of the company on which we stand, deliver and promise. We are committed to delivering innovation and collaborating with our clients to help them become high-performance organizations. With deep industry and business process expertise, broad global resources and a proven track record, we can mobilize the right people, skills, and technologies to help clients improve their performance. SUNWISE SOLUTIONS helps organizations capitalize on the wealth of information contained in their enterprise systems. Whether driven by the desire for better insight into customer and partner transactions or by compliance requirements, organizations look to us to help them improve decision-making, implement strategic planning, and increase the overall value of their information. We provide expert quality IT services to our clients representing wide areas of industry and government. Considering the current trend of sustainable green technologies, SUNWISE Solutions with its significant experience in implementing content and data management solutions is stepping forward towards maintaining sustainability by enabling content and life cycle cost analysis/modeling software for green materials based on ISO14021 standards. 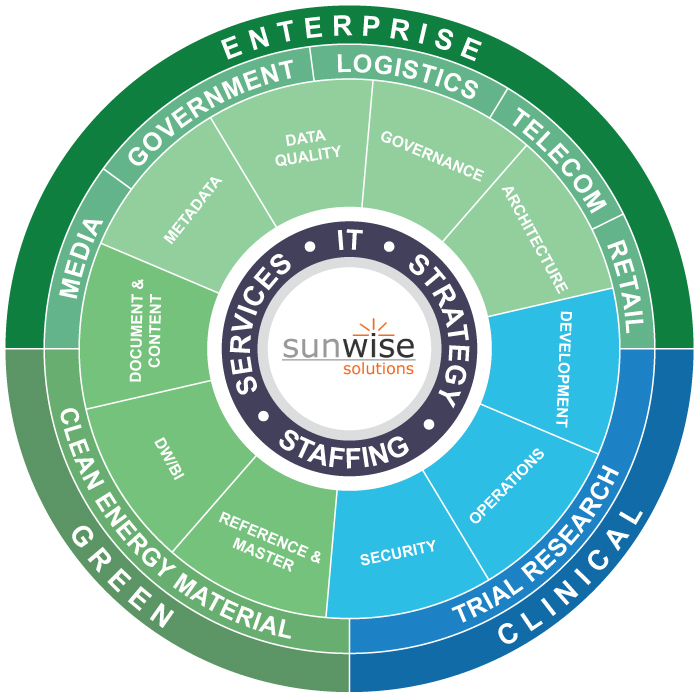 SUNWISE Solutions Clinical IT practice provides usability and an integrated repository solution for the raw untapped clinical data with a user friendly interface, electronic data capture (EDC) capability, data management features and CDISK reporting formats for Pharmaceutical and Clinical Research Organizations (CROs). 21 JDatabaseDriver->loadObjectList() Same as call in the line below.